Blessing: The blessings of Dionysos are joy and passion, madness and prophecy, ecstacy and freedom. Dionysian freedom is beyond good and evil: it takes precedent over law, custom, inhibition or morality. In the worship of Dionysos, we discover who we really are, beneath all the masks and lies and compromises that society demands of us. 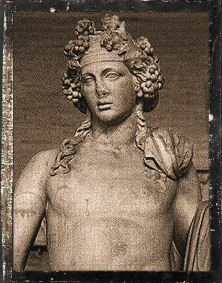 Dionysos dissolves all boundaries and destroys every falsehood. In the ecstatic state, we feel ourselves to be whole, to be one with all of the other worshippers, with the earth and the Gods. We utter prophecy, since we are no longer constrained by our small minds. We perform miracles, since the laws of nature no longer apply. We touch the face of God, and he touches us. Equated With:Osiris, Serapis, Apis, Set, Adonis, Antinous, Yahweh, Priapus, Ba¡¯al, Siva, Katagarma, Ptolemy IV, Ptolemy XII, Marcus Antonius, Attalos. Ways to honor: Drink wine. Attend theater. Dance. Sing. Learn a form of divination. Explore madness. Be passionate. Be creative. Enjoy every moment of living — even the harsh and unpleasant ones. Donate your time or money to support the theater, dance companies, and musical arts. See also Written in Wine, a devotional anthology in honor of Dionysus, published by Bibliotheca Alexandrina. Nothing to do with Dionysus?